Injuries in and around the shoulder, including acromioclavicular joint injuries, occur most commonly in active or athletic young adults. However, pediatric acromioclavicular injuries have also increased owing to the rising popularity of dangerous summer and winter sporting activities. Proper knowledge of the different problems and treatment options for shoulder disorders is necessary to help patients return to their preinjury state. Acromioclavicular joint injuries are often seen after bicycle wrecks, contact sports, and car accidents. The acromioclavicular joint is located at the top of the shoulder where the acromion process and the clavicle meet to form a joint (see the following image). Several ligaments surround this joint, and depending on the severity of the injury, a person may tear one or all of the ligaments. Torn ligaments lead to acromioclavicular joint sprains and separations. The distal clavicle and acromion process can also be fractured. Injury to the acromioclavicular joint may injure the cartilage within the joint and can later cause arthritis of the acromioclavicular joint. Treatment of acromioclavicular separations has been a subject of debate. In general, types I and II injuries are treated nonoperatively in the acute setting, and types IV, V, and VI injuries generally require surgical repair. However, reaching a consensus regarding the optimal management of acute type III injuries has been difficult (see Treatment). The acromioclavicular joint is made up of 2 bones (the clavicle and the acromion), 4 ligaments, and a meniscus inside the joint. The normal width of the acromioclavicular joint is 1-3 mm in younger individuals; it narrows to 0.5 mm or less in individuals older than 60 years. The acromioclavicular joint is a diarthrodial articulation with an interposed fibrocartilaginous meniscal disk that links the hyaline cartilage articular surfaces of the acromial process and the clavicle. The joint is horizontally and vertically stabilized in anterior and posterior translation by a combination of dynamic muscular and static ligamentous structures, which allow a normal anatomic range of motion. Because of the transverse orientation of the articulation, direct downward forces may result in shear stresses that cause disruption of these stabilizing structures and create displacement beyond the normal limits. This is evidenced by abnormal positioning of the clavicle relative to the acromion, usually in the superior direction. The acromioclavicular capsular ligaments provide most of the joint stability in the anteroposterior (AP) direction. The 2 coracoclavicular ligaments (the conoid and the trapezoid ligaments) are found medial to the acromioclavicular joint and attach from the coracoid process on the scapula to the inferior surface of the distal clavicle. These ligaments provide vertical (superior-inferior) stability to the joint (see the following image). [2, 3] Compression of the joint is restrained mainly by the trapezoid ligament. The deltoid and trapezius muscles are especially important in providing dynamic stabilization when these ligamentous structures are damaged. Torn acromioclavicular joint ligaments and/or torn coracoclavicular ligaments are seen in acromioclavicular joint sprains. The meniscus that lies in the joint may also be injured during sprains or fractures around the acromioclavicular joint. 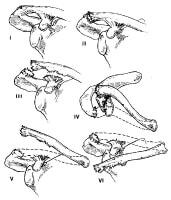 The superior shoulder suspensory complex (SSSC) is a bony and soft-tissue ring composed of the glenoid process, the coracoid process, the coracoclavicular ligament, the distal clavicle, the acromioclavicular joint, and the acromial process at the end of a superior bony strut (the midshaft clavicle) and an inferior bony strut (the junction of the lateral scapular body and the medial glenoid neck). Type III, IV, V, and VI acromioclavicular separations are double disruptions of the SSSC characterized by disruptions of both the coracoclavicular and acromioclavicular ligaments. As a result, these constitute unstable injuries that must be accounted for or that require surgical reduction and stabilization. The severity of an acromioclavicular separation is dependent upon the degree of ligamentous injury. When the ligaments are injured they are either sprained or, in more severe cases, torn. Severe forces resulting from significant falls are often associated with type III-VI injuries. Acromioclavicular joint sprains have been classified according to the severity of injury to the acromioclavicular and coracoclavicular ligaments, the acromioclavicular joint capsule, and the supporting muscles of the shoulder (trapezius and deltoid) that attach to the clavicle. An acromioclavicular joint sprain is more common than a fracture after an injury. However, fractures of the distal clavicle and the acromion process may occur, so the healthcare provider must be aware of such injuries and ready to diagnose and treat them as well (see Clavicular Injuries). Allman and Tossy initially proposed a 3-grade classification[7, 8] that Rockwood expanded to 6 types of injury (see the following images). [9, 1] Type I and II injuries are the same in both classification schemes, with type III injuries in the Tossy classification subdivided into grades III, IV, V, and VI in the Rockwood classification. 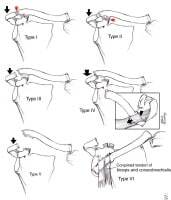 Type I-III acromioclavicular injuries are the most common injuries. In a type I sprain, a mild force applied to the acromioclavicular and coracoclavicular ligaments does not tear them. [7, 8, 10] The injury simply results in a sprain, which hurts, but the shoulder does not show any gross evidence of an acromioclavicular joint dislocation. Type II sprains are seen when a heavier force is applied to the shoulder, disrupting the acromioclavicular ligaments but leaving the sprained coracoclavicular ligaments intact. [7, 8, 10] When these injuries occur, the lateral clavicle becomes a little more prominent. In type III sprains, the force applied to the shoulder completely disrupts the acromioclavicular and coracoclavicular ligaments, leading to complete separation of the clavicle and obvious changes in appearance. The lateral clavicle is very prominent. Type IV injuries are defined by posterior displacement of the clavicle relative to the acromion with buttonholing through the trapezius muscle. In type V injuries, the clavicle is widely displaced superiorly relative to the acromion as a result of disruption of muscle attachments. The rare type VI injuries are characterized by inferior displacement of the distal clavicle below the acromial process or the coracoid process. Acromioclavicular joint injuries in children are relatively uncommon, and they differ anatomically from such injuries in adults. The immature clavicle is encased in a periosteal tube. The coracoclavicular ligament is within this tissue, whereas the acromioclavicular ligament is exterior to it. This anatomic relationship explains why the acromioclavicular ligament is frequently injured with direct trauma, whereas the coracoclavicular ligament remains intact. When evaluating a pediatric radiograph, remember that incomplete closure of or failure of an ossification center may appear to be a fracture. The most common mechanism of injury to the acromioclavicular and coracoclavicular ligaments is a direct force applied to the superior aspect of the acromion, usually from a fall with the arm in an adducted position. This impact drives the acromion inferiorly, spraining the intra-articular acromioclavicular ligaments. If the force is great enough, the extra-articular coracoclavicular ligament may also be damaged. Less commonly, an indirect force may be transmitted up the arm as a result of a fall on an outstretched hand (FOOSH injury). The force continues through the humeral head to the acromial process, displacing it superiorly and stressing the acromioclavicular ligaments. The coracoacromial ligaments are not injured with this type of mechanism. Other injuries, depending on the force of injury, may include tears of the deltoid and trapezius attachments at the clavicle and fractures of the acromion, clavicle, and coracoid (or of their cartilaginous attachments). The true incidence of acromioclavicular injury is not known, as many affected individuals do not seek treatment. Approximately 12% of all dislocations involving the shoulder affect the acromioclavicular joint. Athletes participating in contact sports (eg, football, rugby, hockey, martial arts) are at increased risk of acromioclavicular joint injuries,[12, 13] and injuries to the acromioclavicular joint are the most common reason that athletes seek medical attention following an acute shoulder injury (glenohumeral dislocations are the second most common injuries seen) (see Shoulder Dislocation). Patients involved in motor vehicle collisions with direct trauma to the apex of the shoulder are also at risk for such injuries. Males are more commonly affected than females, with a male-to-female ratio of approximately 5:1, and younger individuals (< 35 y) sustain more acromioclavicular injuries, primarily due their greater participation in high-risk activities. Men in their second through fourth decades of life have the greatest frequency of acromioclavicular joint injuries, which are most often incomplete tears of the ligaments. No difference in injury patterns exists among various racial or ethnic backgrounds. Significant morbidity is negligible with type I and II acromioclavicular injuries. Following nonoperative management of type II injuries, patients in most long-term studies have shown good-to-excellent outcomes as well. These patients usually require a longer period of recovery that those with type I injuries, usually returning to sports in 2-4 weeks. Morbidity is highest with type III injuries, which may be due to the controversy surrounding management. However, those treated nonoperatively generally do quite well. There is a scarcity of literature regarding long-term follow-up after surgical repair of type III. Mortality is not commonly associated with acromioclavicular injuries. Just like any other joint in the body, once the acromioclavicular joint has been injured, it has a tendency for arthritis and pain, with pain in the joint being the most common problem after these injuries. In type III sprains, the most common setback is also instability in the clavicle from the torn ligaments. Degenerative changes involving the acromioclavicular joint are common late complications. Symptomatic traumatic arthritis may develop following nonoperative management of type I or II injuries. Surgery is often indicated to alleviate symptoms. However, symptomatic acromioclavicular joint arthritis may also develop in patients who undergo surgical management acutely. Impingement symptoms, muscle-fatigue discomfort, and/or neurovascular symptomatology may occur in patients treated nonoperatively for type III separations and may require a surgical reconstruction. Postoperative complications may also arise. The most common complication is mild residual instability after ligament reconstruction. This complication was more common when screws, sutures, suture tape, and Kirschner wires (K-wires) were being used to repair coracoclavicular ligament tears. Migration may also occur if pins or wires are used for fixation. Other postprocedure complications include osteomyelitis, soft-tissue ossification, and failure of fixation with recurrent deformity. Infections (eg, wound infection) may also occur, but these are rare, occurring less than 1% of the time. When a patient is dealing with an arthritic acromioclavicular joint, the most common problem is inadequate resection of the clavicle during surgery. This causes continued acromioclavicular joint pain in these patients, but it is easily fixed with proper arthroscopic resection of the fragment.